The Secure Rural Schools payments have been reestablished for the next two years. This program provides payments to communities whose land base contains federal forests. This will provide much needed relief to our Southeast Alaska communities. This affects every community in Senate District R.
The Essential Air Service program guarantees a minimal level of scheduled air service by certificate holding air carriers who access isolated communities. Access to air travel is vital to our way of life in Southeast Alaska. This is good news for local economies and those Alaskans living in isolated communities. There are 11 communities in Senate District R that will continue to benefit from this program. On March 19, 2018, the Senate Resources Committee voted to move Senate Joint Resolution 13 (SJR 13) forward for consideration by the full Senate. SJR 13 is a resolution urging the United States Congress to amend the Marine Mammal Protection Act and urging certain federal agencies to permit Alaska Native organizations and the Alaska Department of Fish and Game to co-manage, take, and study sea otters. The current management policies of the federal government are a complete failure. I presented facts to the Senate Resource Committee on March 12, 2018, supporting reasonable reductions for our poorly managed sea otter population in Southeast Alaska which is rapidly reducing our shellfish resources. The sea otter population in Southeast Alaska has dramatically increased from the initial 400 which were reintroduced in the 1960s and today it is estimated to be around 51,000. This number is growing by 13% per year with the average lifespan of the sea otter being 13-20 years. Each sea otter eats nearly one-third of its body weight per day in shellfish and other foods. The Board of Fish estimates sea otters will be eating over 1 million pounds of shellfish per day by 2030 if no substantive action is taken to control population growth. 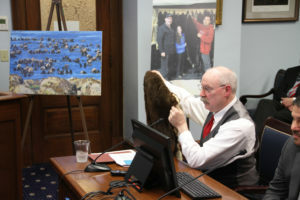 We simply cannot allow the unchecked growth of sea otters to eat Alaskans out of house and home. Sea otters are affecting commercial fisheries and the way of life for our rural communities who rely heavily on shellfish resources such as abalone, crab, clams, and other subsistence foods. The policy changes recommended in my resolution, Senate Joint Resolution 13, would allow Alaska Natives who are enrolled in a federally recognized tribe or under the Alaska Native Claims Settlement Act to hunt sea otters within reasonable limits. We are also urging the management authority of sea otters be transferred to the state and/or tribes from the federal government. This can provide the framework to establish a closer working relationship with those who are currently being impacted to address the subsistence, commercial, and cultural concerns. I will provide further updates as this legislation progresses through the Alaska State Legislative process.